Arthroscopic release for the stiff elbow has been widely used, but there are no reports limited to severe stiffness. The purpose of this study was to investigate the outcomes of severe cases. Ten patients with 10 severely stiff elbows defined by a limited arc of ≤ 60° underwent this arthroscopic release. Causes of stiffness were post-traumatic stiffness (one patient), osteoarthritis (three patients), and rheumatoid arthritis (six patients). Using arthroscopy, the capsule contracture and the intra-articular fibrosis were removed and the impinging osteophyte and part of the radial head were resected. 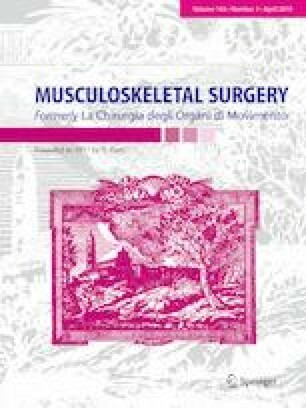 For four patients with preoperative ulnar nerve symptoms or contracture of the posterior oblique ligament of the medial collateral ligament, mini-open ulnar nerve neurolysis and release of the posterior oblique ligament were performed. Patients were followed up for an average of 24 months. Arthroscopic release could be performed without any intraoperative complications. Range of motion for the elbow significantly improved from 95° of flexion and − 55° of extension to 109° of flexion and − 32° of extension. The Mayo Elbow Performance Score also improved from 56 points to 80 points. Two patients underwent a second arthroscopic surgery and gained further arc of motion. One patient showed osteophyte reformation and needed revision open surgery 1 year after the initial surgery. Arthroscopic release for the severely stiff elbow could improve range of motion. Careful attention should be given during surgery to avoid complications such as intramuscular bleeding or nerve damage. This study was approved by the institutional review board and performed in accordance with 1964 Helsinki Declaration. Each patient gave informed consent for participation.